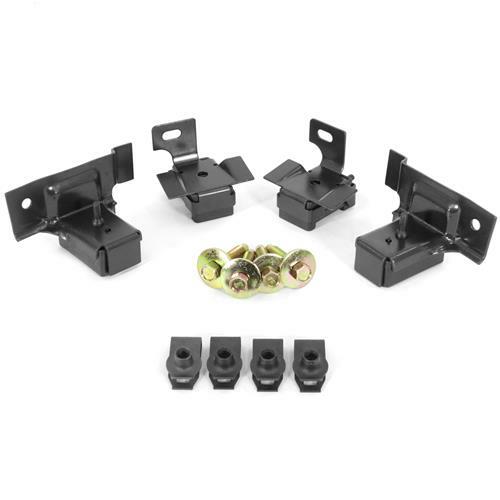 Restore the engine bay of your 1982-1993 Mustang with a set of 5.0 Resto A/C condenser mounting brackets! Over time, the steel brackets that hold your A/C condenser in place tend to rust and wear away. Along with the steel, there are rubber isolators that deteriorate over time. These brackets secure your condenser to the core support and once they wear you could experience unwanted movement from your condenser. Replace these vital components with a new set from 5.0 Resto! Included in the kit are the two upper brackets, two lower brackets, and mounting hardware. Remove the 10mm retaining bolt from the upper radiator brackets and then remove the bracket; do this for the other side. Dislodge the harness clips to position to the harness out of the way. On the driver side, loosen and remove the 8mm bolt securing the upper condenser bracket. Underneath the car, loosen and remove the 8mm bolt securing the lower condenser bracket. Remove the upper bracket from the car. Remove the speed nut and install the new one. Position the new bracket into place and tighten the provided 8mm bolt; the upper brackets are not side specific. Remove the lower speed nut and clean the area if needed. Install the new speed nut. Install the correct lower bracket into the core support. These are side specific, but will only install one way. Reposition the harness clips, reinstall your battery, and upper radiator brackets. 5.0 Resto products are built with the goal of keeping your Fox on the road for a long time. This goal is evident from the moment you lay your eyes on this kit. Constructed with high-quality steel, this kit is durable and built to last. A new set of rubber isolators is pre-installed into both the upper and lower brackets to absorb noise and vibration from the road. Completed in a black painted finish, this bracket kit resists corrosion for protection that lasts. New mounting hardware is included for a quick and easy installation! What’s up everybody, Landan with LMR.com! Welcome to my overview and install on these A/C condenser brackets from 5.0 Resto fitting 1982 to 1993 Fox Mustangs equipped with factory air conditioning. Alright guys, this A/C condenser mounting bracket kit is going to feature stamped steel construction with factory-like bends, a black painted finish, and of course new rubber isolators. Now key benefits from this kit is going to be that it will replace rusted, worn, or missing brackets and hardware which will keep the condenser secured in place, and of course be a direct replacement for your restoration project. In the box will be two upper brackets, two lower brackets, 4 retaining bolts, and 4 speed nuts. To get started, support the front of the car with jack stands. This will provide adequate working room to access the lower condenser brackets. Remove the positive and negative battery cables from the battery. Loosen and remove the battery hold down bolt and block. Doing this will allow the condenser to rotate just enough so that you can remove the upper bracket. Remove the lower speed nut and clean the area if needed. Install the new speed nut. Tighten the provided 8mm bolt. Repeat these steps for the side. If you supported the car, get it on the ground. Double check your work and you’re all finished. For the most part, replacing the condenser brackets is very straightforward guys. Again, if you’re missing your brackets or simply want to freshen them up with a new set; I would highly recommend this condenser bracket kit from 5.0 Resto. To see more how-to and review videos covering industry leading products, be sure and subscribe to our YouTube channel, like this video, and turn on notifications. While you’re at it, checkout our other videos and shop LMR.com for all things 1979 to present Mustang and SVT Lightning!